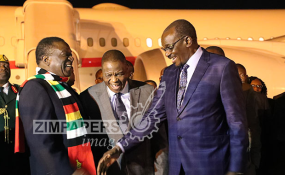 Zimbabwe President Emmerson Mnangagwa on Tuesday defended the decision to raise fuel prices as the "right thing to do" to stabililze supply. A crackdown against the protests that followed, however, led to the deaths of at least 12 people. The events were "regrettable," Mnangagwa said on Twitter and added that "violence or misconduct by security forces was unacceptable and a betrayal of the new Zimbabwe ... and will be investigated." At least 78 people were treated for gunshot injuries sustained during the crackdown, according to the Zimbabwe Human Rights NGO Forum, which recorded more than 240 incidents of assault and torture. About 700 people have been arrested. The government claims the protests were an a ploy by the opposition Movement for Democratic Change (MDC) to destabilize the country. MDC leader leader Nelson Chamisa said the government must take responsibility for the killings of unarmed civilians. "This is a sick government because no serious government will deploy military and live ammunition against ordinary citizens," he said at the funeral of a young footballer shot during demonstartions. A move by the government to shut off the internet in what critics say was an attempt to prevent the security crackdown being broadcast to the world, was met with widespread condemnation. The Zimbabwe High Court ruled on Monday that the government did not have the power to order the shutdown of the internet. "The government of Zimbabwe must move forward to ensure justice and accountability for serious abuses," Human Rights Watch's Southern Africa director Dewa Mavhinga told DW. "Otherwise there will be a vicious circle of abuses because there is no accountability." Mnangagwa had been due to attend the World Economic Forum in Davos as part of an overseas trip seeking much-needed foreign investment. He visited Russia, Belarus and Azerbaijan and Kazakhstan before he cutting his trip short due to the unrest in Zimbabwe. His finance minister attended the forum instead.